It's that magical time of year when we get to take a step forward into a fresh new year. But, before we hit the refresh button I'd like to take a look back at my ten favorite photos from 2014. Snow days are a treat here in Vancouver, Washington. 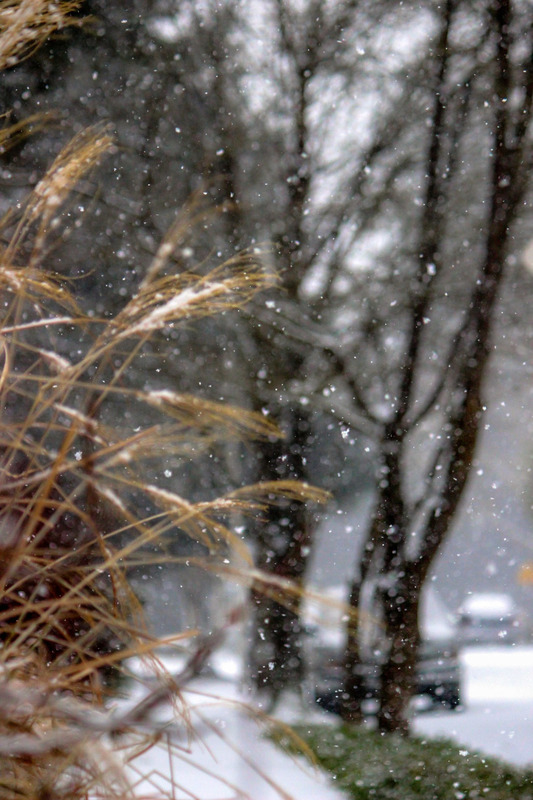 I spent the day trying to capture pictures of snow flakes falling in my garden while the neighborhood played in the snow. I like the quiet mood of this pictures. 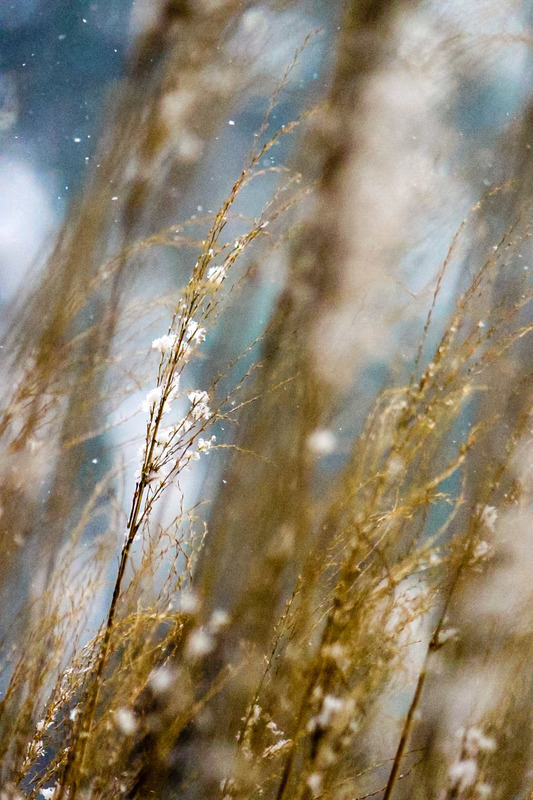 Snowflakes clinging to grass blooms have a delicate beauty. I captured a splash on my thawing rain chain. I took several hundred shots to capture this one splash. My active garden season officially kicks off with the spike winter hazel, Corylopsis spicata, bursting into bloom. I like this shot with the sweet scented tassel-like flower unfurling on a cloudy day. I fell in love with the Violetto Artichokes that I planted in My Victory Garden. I took many pictures of the two blooms as they unfurled. 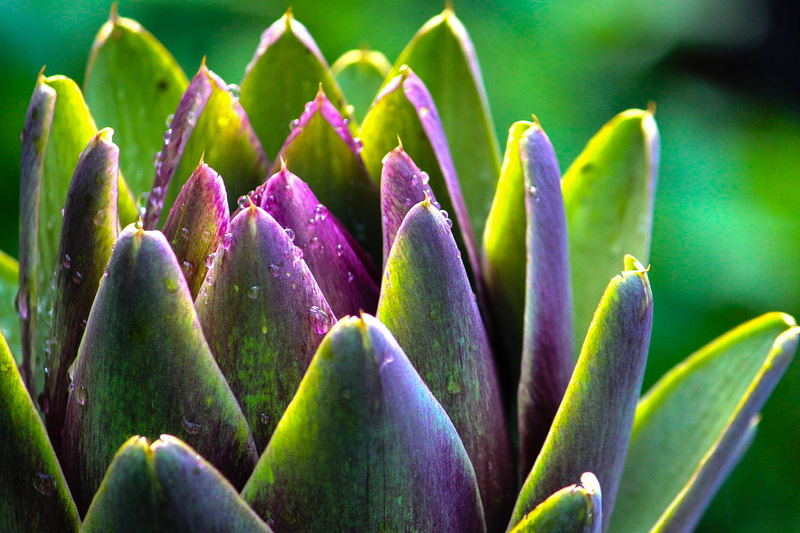 I loved the contrast of the sharp jagged purple artichoke against the soft bokeh of the evening sun. The unprocessed version of this shot was one of the fifteen finalists in the Oregonian's annual garden photo contest. This version was published in the December issue of the NW Creative Arts Magazine. Bronze fennel punctuates my garden with its soft fine foliage. I like the contrast of the evening light and purple stems of the fennel. I took this shot of the Violetto artichoke bloom as an afterthought while I was working in My Victory Garden with My Pirate. I'm sure glad that I did! It was selected to be in the Oregon Farm Bureaus's 2015 Calendar. I received 20 calendars that I shared with my friends and readers. I looked up while weeding and realized that the Tetrapanax papyrifer 'Steroidal Giant' is the jungle in my front yard. I grabbed my camera and snapped this shot. I like it in black and white because you focus on the structure of the leaves and stems. A gorgeous plant. I took this shot for my Beneficial Landscaping Powerpoint that I presented to the 2014 WSU Clark County Master Gardener Class. The ladybugs binge eat fennel pollen before they mate and lay their eggs in the aphid colonies in my garden. Just one more reason why I use organic practices in my garden. I took this shot out in the community garden at Pacific Park. I was harvesting tomatoes out of my plot when the clouds suddenly broke and the colorful sunset poured through the garden. I also liked the symbolism of a bloomed out sunflower gazing at the sunset. Barnaby likes to pose for the camera especially when I'm holding a treat. I like how his whiskers, mouth, and jowls are in focus. I cropped out all the drool. Thank you for taking a look back through the year with me. Tonight, I picked up a new macro lens(!) and look forward to exploring flowers and insects in my the garden. Please stop by the lovely host of the My Ten Favorite Photos of the Year meme, A Tidewater Gardener. And JMG Galleries also has a great favorite photos of the year project that I'm going to participate in. What is your favorite photo that you've taken this year? I'd love to see it. Happy New Year!